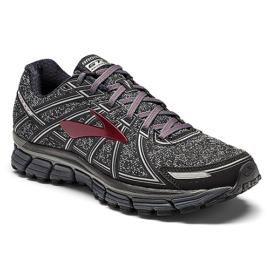 The next evolution of athletic walking comes in the Brooks Adrenaline GTS 16. The midsole dynamically adapts to every step thanks to our DNA midsole,while your body is guided into it’s natural alignment with the help of a supportive Progressive Diagonal Rollbar. Plus,smooth heel-to-toe transitions are made possible by our Full-Length Segmented Crash Pad. This sixteenth edition is more plush than ever—an updated V-Groove folds deeper inward to absorb and disperse impact away from the foot. The perfect balance of cushion and support for runners ready to go the distance. Fit Tip: This style is running a 1/2 size small. We suggest ordering a 1/2 size larger than your usual size! Keep your cool under pressure with a low-profile hiking shoe. Mesh insets allow a continual airflow, while a stability shank and a rugged, higher-traction outsole let you take on tough terrain with confidence. A lightweight pigskin leather upper with mesh gives this classic men’s running shoe its inimitable look, while a combo of premium cushioning and stability deliver the feel that keeps you coming back. And we’ve made some subtle updates for this 4th generation: it’s more breathable, sports a lace keeper to keep the tongue in place, and has a new streamlined “N” logo. Hawaiian inspired men&apos;s quality sandals. Hand-sewn toe post and upper, octopus inspired laser-etched artwork. The new Men’s ON® CLOUDSWIFT®Helion your run. Prepare to level-up your performance running range with the new Cloudswift – the first shoe engineered using our Helion™ superfoam. The Phantoms sandals were made for long weekends. If you’re a person who can pack unlimited fun into three days than you need an athletic sandal that can keep up. That’s the Reef Phantom guy’s sandal. It features a soft, comfortable, water-friendly synthetic nubuck upper with air mesh lining, and a contoured injection molded EVA footbed and outsole with anatomical arch support. In the water and out, these sandals are durable with fantastic grip to keep you on your feet all weekend long.